This post may have bad timing since I just recently published a post about how I don’t eat out EVERY night, but please forgive my contradiction because I have a home meal post coming up tomorrow. For now, you REALLY want to read this one. Like, really. I don’t do a full recap of every dinner I have out (just photo dumps), especially if the restaurant has already been featured in its own post on the blog before. However, the meal I enjoyed last Thursday night at the Max Restaurant Group‘s seafood establishment, Max Fish, in Glastonbury, CT was so noteworthy that I had to do an entire post on it. Let the gushing commence! 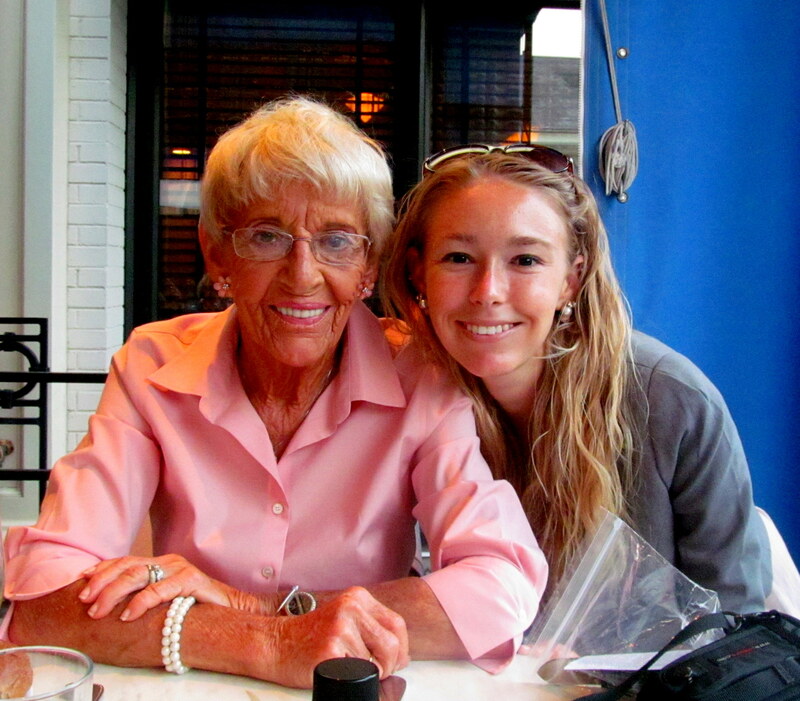 My grandma (we call her Grannan) had arrived that afternoon from Florida, and my mom and I knew we wanted to take her somewhere special for dinner. Thankfully my family had plenty of points racked up from the Max restaurants’ free rewards program, Max Vantage. Ever since hearing about the Max Fish Tiki Dinner I attended, my mom has been dying to try their regular menu (she is already a fan of their award-winning happy hour), so we decided to use the rewards points there. 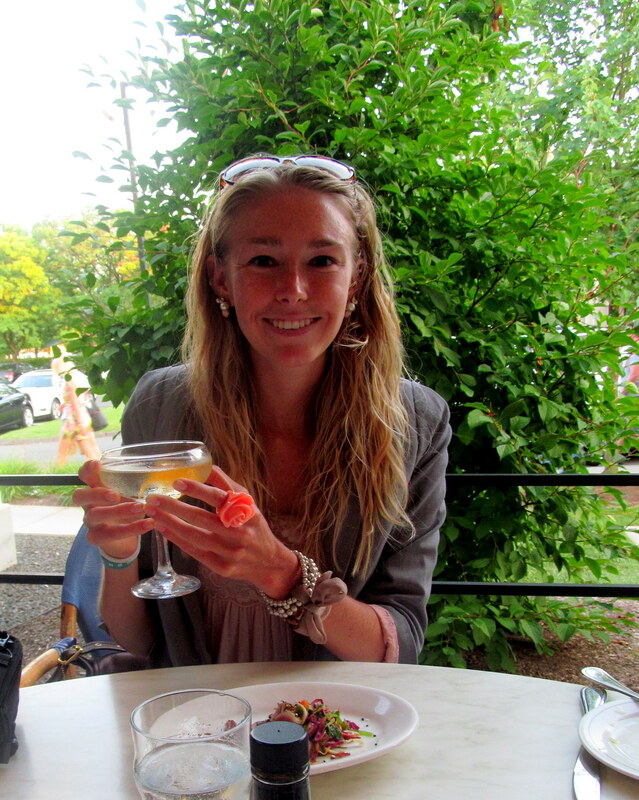 Plus, they have an outdoor patio – I love dining al fresco! My grandma, mom, sister, and I decided it was the perfect spot to celebrate Grannan’s arrival. 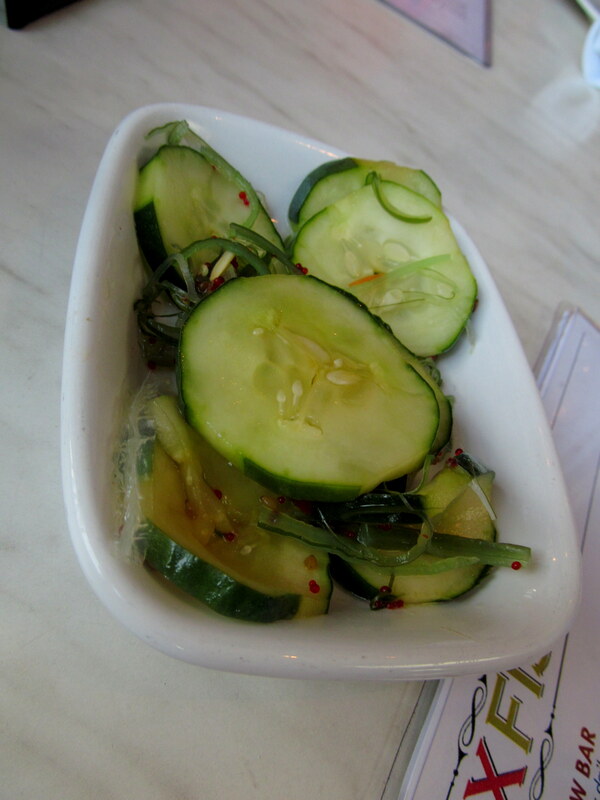 Once seated we were immediately served the above sampling plate of seaweed and pickled cucumber salad. That certainly started the meal out on a high note! The combo was genius and the cucumbers were pickled just enough. Any more and they definitely wouldn’t have paired as well with the seaweed. We also got a pretty great bread basket. The wheat rolls were just OK to me, but the other variety of roll contained raisins and caramelized onions. Those were so flavorful that they didn’t even need any butter – but that didn’t stop me from using a bit 😉 My favorite part of the bread basket actually wasn’t bread – it was the flatbread crackers with sesame and what I believe were caraway seeds. So satisfyingly crunchy and hearty. 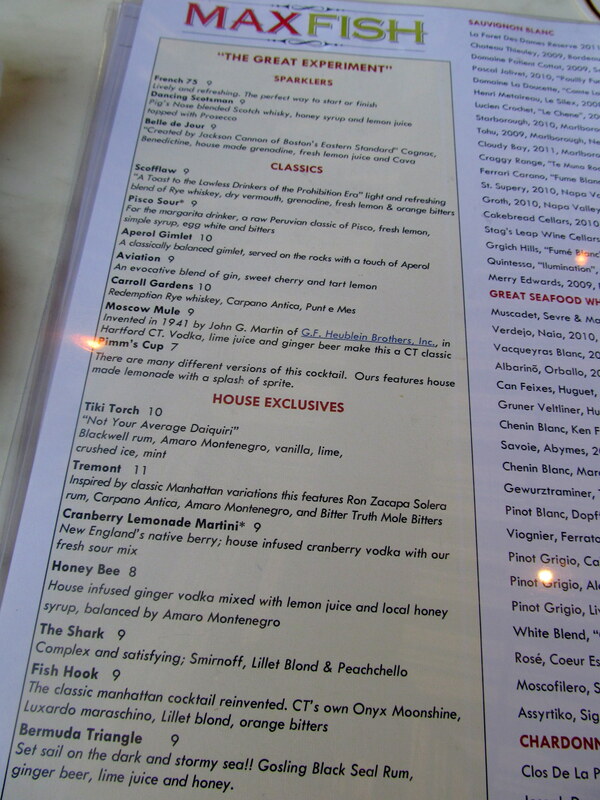 Max Fish has one of those cocktail menus (pictured above) that I could study and debate for hours. They certainly proved themselves to be expert mixologists at the Tiki Dinner! I love wine, but felt like it’d be a cocktail appreciator’s sin to not order one (or two!) of these gems. It actually didn’t take me too long to decide on the Fish Hook, Max Fish’s take on the Manhattan, because of its main ingredient: Onyx Moonshine. I’ve spoken with the owners of this Manchester, CT-based company a few times at events, and they are a great group of people putting out an excellent, smooth liquor. As expected, the Fish Hook was amazingly refreshing and the orange peel in it looked pretty awesome as well. I savored every sip. My sister was very surprised when she ordered a Diet Coke and it came out in an old-fashioned Coke bottle. Cute! She may kill me for using this. 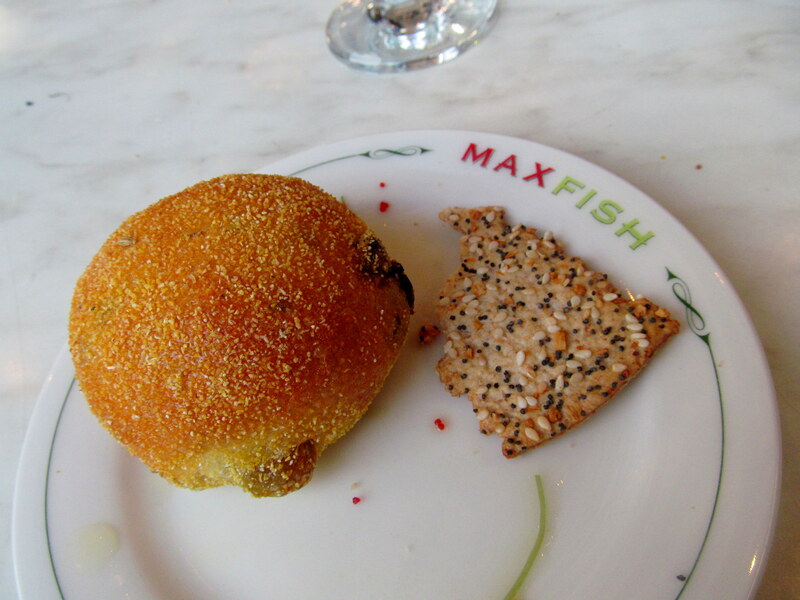 I was debating between ordering tuna and swordfish (the dinner menu is pretty epic…lots of menu indecision anxiety for me!…and cool sidebar – Max Fish has a gluten-free menu! 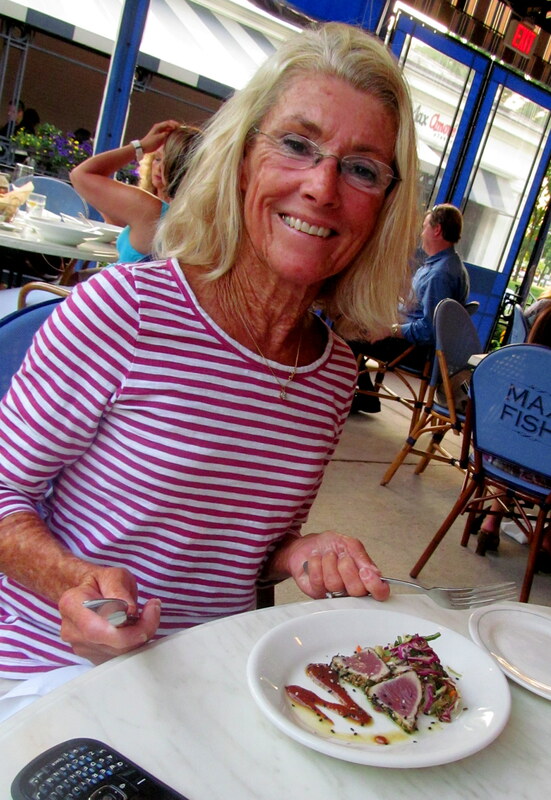 ), and that decision was made easier for me when my family and I had the chance to sample the rare yellowfin tuna. I was ecstatic that my mom, grandma, and sister were all willing to try it. And better yet, the madre and Grannan declared that they LOVED the rare tuna! I can totally understand why and I’m glad that their first taste was at Max Fish. 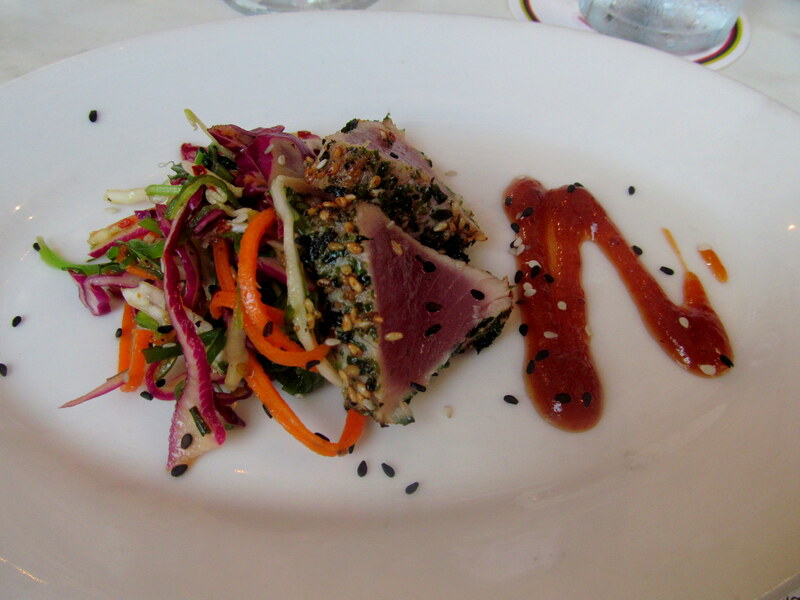 The tuna was cooked to perfection, the exterior crusted in an adequate amount of sesame, and the sauce and slaw garnishes were the perfect compliments. So proud of herself for trying – and enjoying – fish cooked rare! 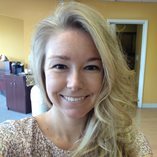 Hannah was not the biggest fan – she is still in the stage in which the only seafood she likes is mahi mahi, what I like to call the “gateway fish” – but she tried! She is not a seafood fan! She much prefers the taste of Diet Coke! When our food came out there was a bit of confusion with the food runner over whose plate was whose, and which fish was which, so my mom and Grannan’s dishes got sent back. But once we realized that everything had actually been correct in the first place, the kitchen was nice enough to warm the entrees back up before delivering them to the table. 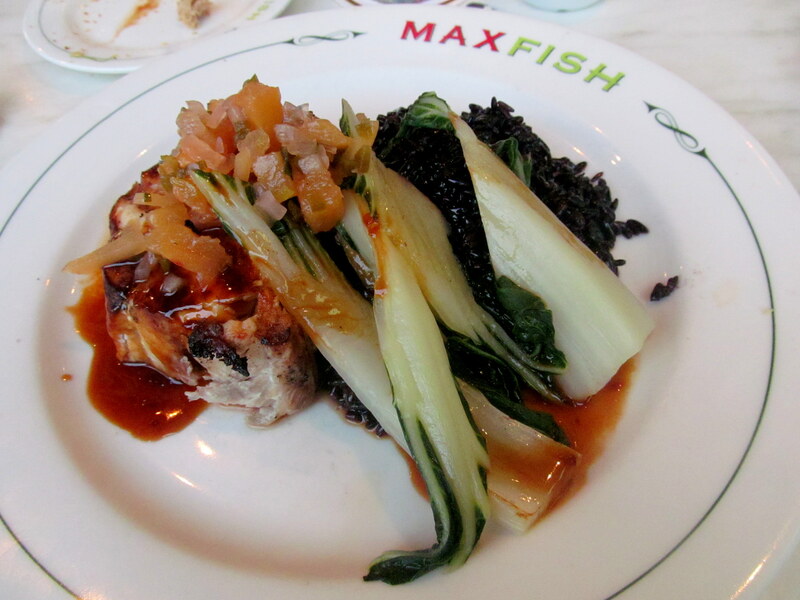 Since I’d tried the tuna, I ordered the above grilled swordfish with pineapple-ginger chutney, local bok choy, and black sticky rice. I have been dreaming of that rice since the Tiki Dinner, and convinced my mom and Grannan to get it with their food too! I never eat rice – I find it to be extremely boring, and it makes me sleepy if I eat even a bit too much, like pasta does. This rice, though, is just the right hint of sweetness and its texture is so fun! I know that sounds strange to say about a food’s texture, but it’s really the first word that comes to mind. 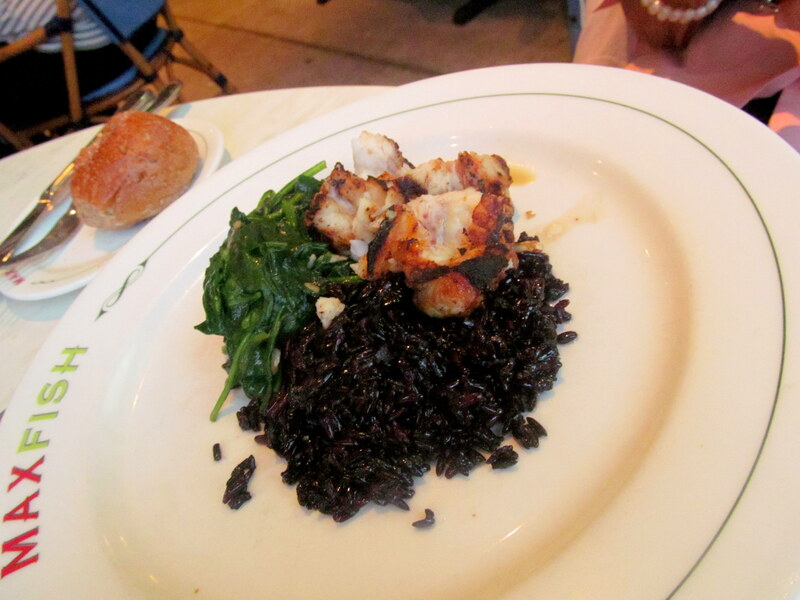 The pineapple-ginger chutney was so amazing paired with the sticky black rice. My only complaint is more like a regret – that I didn’t ask for EXTRA chutney! The bok choy was very well cooked, not too oily, and the swordfish was the thickest cut I’d ever received at a restaurant. The outside was nice and char-grilled while the inside was flaky. No knife was needed to slice off each bite – a fork was plenty. Mom and Grannan continued to make my everythingarian-self happy by taking my suggestion to get the sticky black rice with their entrees as well. They are very much like me when it comes to rice – just not that impressed. But also like me, they were over the moon about Max Fish’s rice! Being true seafoodies though, their favorite meal component was the grilled monkfish. The two of them could not say enough good things about how it was cooked. 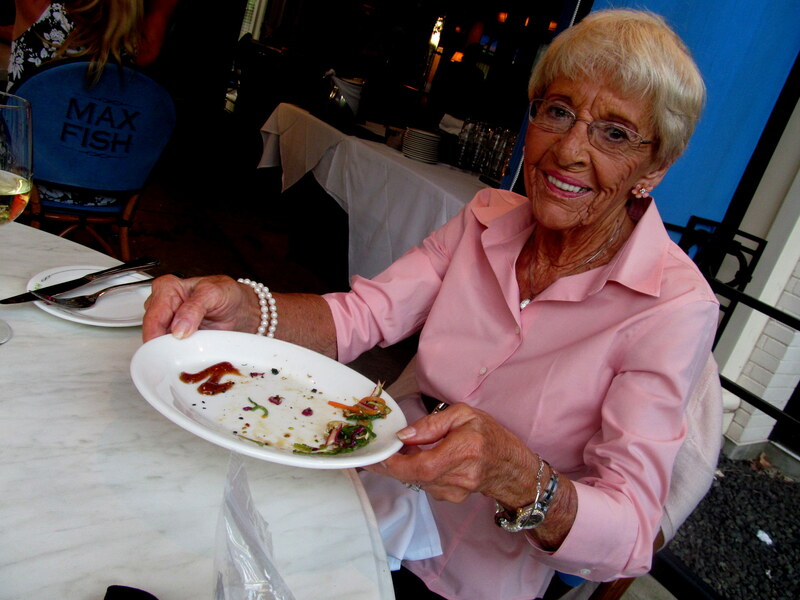 Grannan also swooned over her sauteed spinach (pictured above). 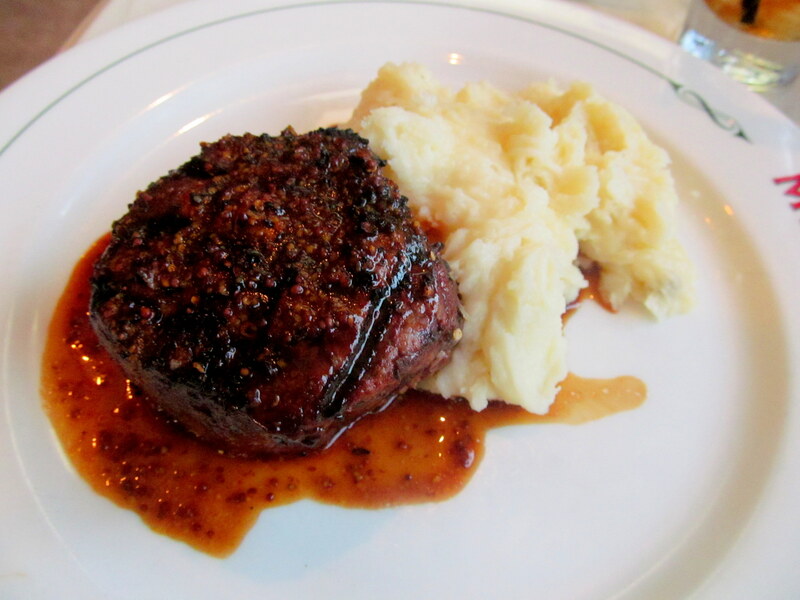 That right there is Hannah’s choice, the 10 oz filet mignon with creamy mashed potatoes. She also got a side of haricot verts to get her green on. She ordered the steak medium and it certainly came out cooked just as she’d asked. I have to admit I’m glad she didn’t finish it all because this filet was beyond-words amazing. As in, it-rivaled-J. Gilbert’s amazing. Yeah, I said it. 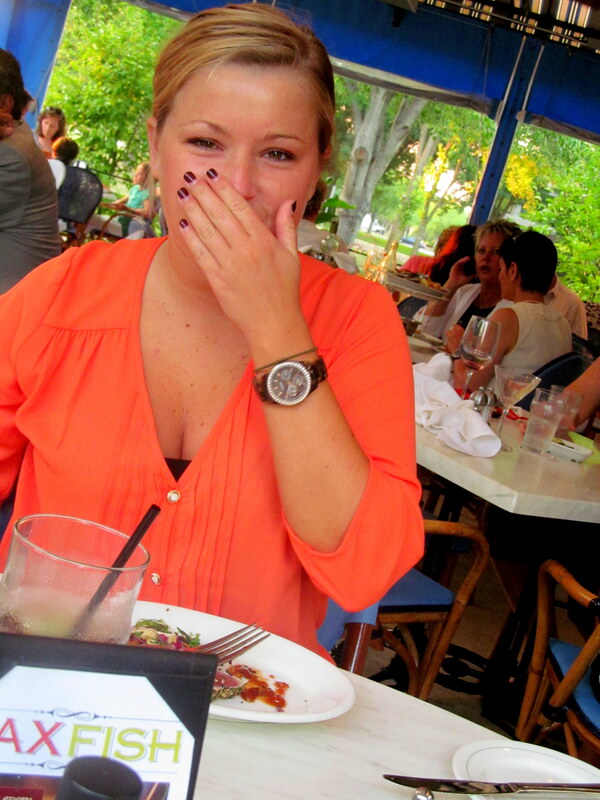 Hannah said those taters hit the spot as well – exactly what she craved. I finished my Fish Hook right when my entree came out, so to go with my meal I ordered something refreshing, light, and citrusy – the French 75. It was served in a fun, classy glass and contained gin, lemon juice, simple syrup, and Prosecco. Didn’t taste much like alcohol, and not a cocktail I’d usually order (a bit sweet), but it was still fun to step outside of my martini-shaped box. The French 75, me, and a bunch of good bread. 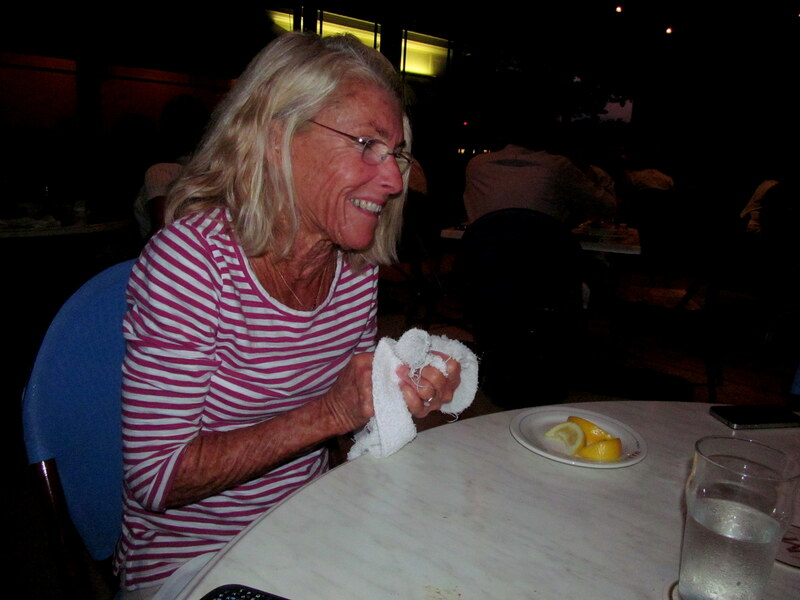 We declined dessert because we were all quite satisfied, so our waitress brought the check, along with some nice warm towels topped with fresh lemons for cleaning our hands. My mom adored that fancy ending! 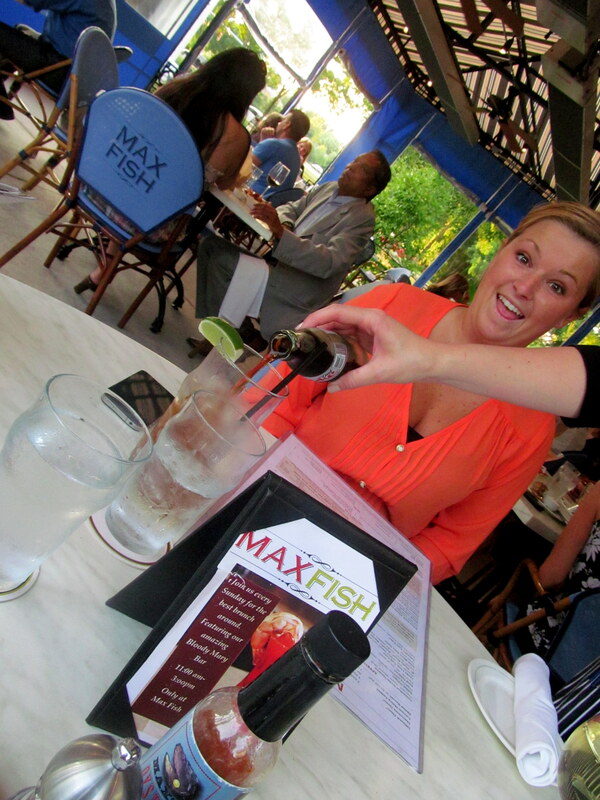 And Max Fish had one more surprise up its sleeve…after-dinner drinks! Again, though it was a sweeter beverage than I’d normally order, I enjoyed the below Strawberry Caipirinha, AKA Brazil’s national cocktail, made with strawberry, cachaca (sugar cane rum), raw sugar, and lime. Hence the lime and strawberry garnishes! 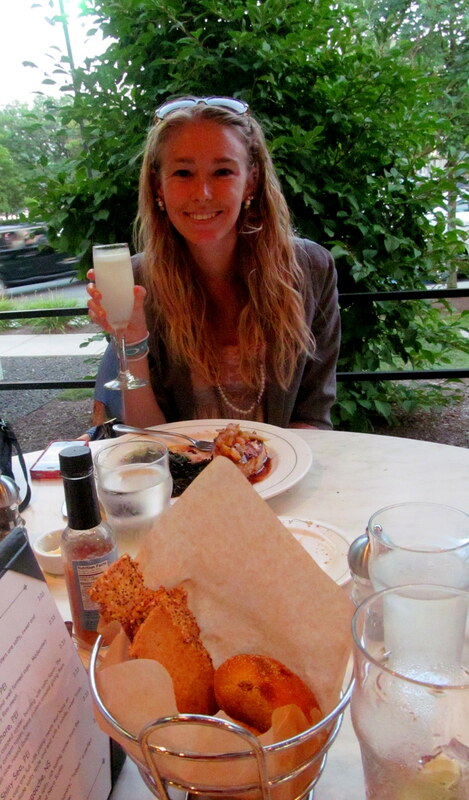 This drink made me feel fabulous and was perfect for a warm summer evening like the one we were enjoying that evening. Lighting doesn’t do it justice – it had gotten dark! Thank you so very much to Max Fish for giving my grandma an amazing welcome-to-Connecticut dinner to kick off her visit from Florida. We promised her a great seafood dinner and the restaurant certainly delivered! 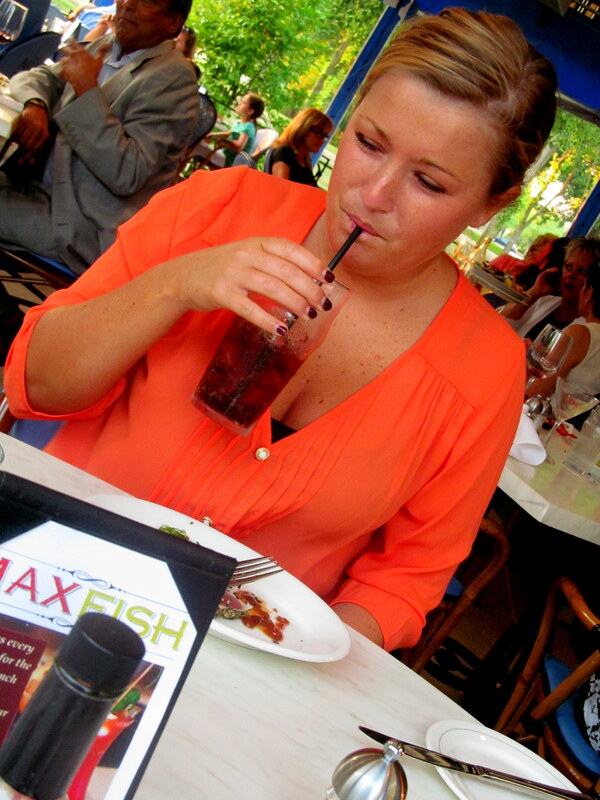 I highly recommend Max Fish for any occasion – or even none at all. If you’re trying to save money, their happy hour is a great way to try a lot of their food options at a discounted price. And don’t forget to read up on the Max Restaurant Group’s Chef to Farm Dinner Series, which already has generated buzz nationally. I’m planning to hit up one of the August dinners, but there is one coming up as soon as the end of July in Simsbury, CT! Click the link, take a look at the menu, and buy a ticket once you recover from passing out (since it’s so amazing). 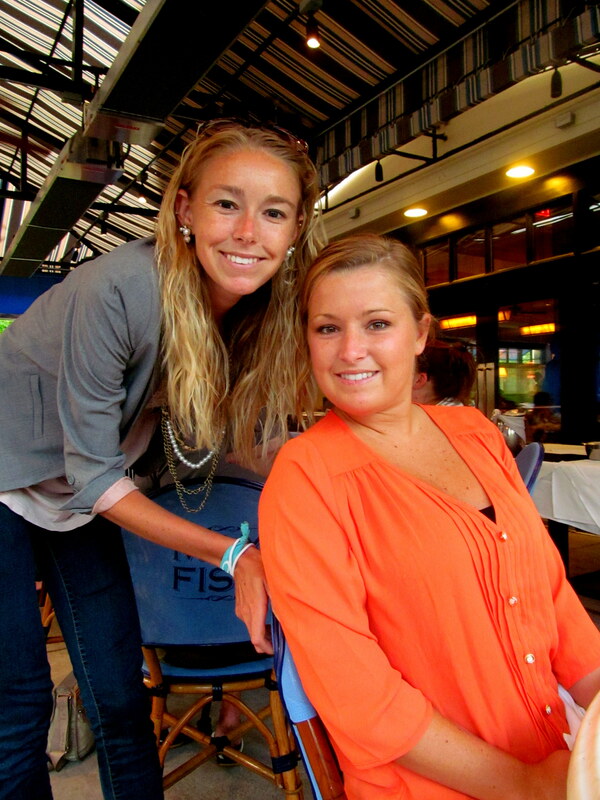 Do you have a favorite seafood spot near you?